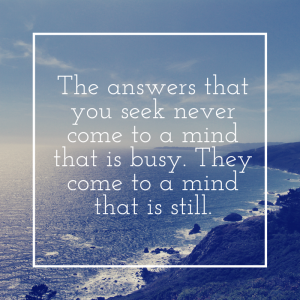 In 2015 I committed to focus on mindfulness. In an effort to improve my awareness of the present moment and strengthen my mind, body, and soul I decided to incorporate yoga into my weekly routine. It was not until I tried yoga that I learned how challenging it is for me to be still and experience the present. My mind is almost always going 100 miles per hour. I have a hard time taking a break and doing nothing (for better and for worse). Mindfulness is important because it brings the individual back to the people and events surrounding them. Elon offers a wonderful wellness program for employees that includes yoga twice a week, so I was able to ease into beginner yoga classes starting in January. During yoga practice you are asked to clear your mind of all thoughts and focus on your breathing. Do you know what happened when I started attending these classes? I would get to class, stretch out on my mat, and then start thinking about work, meetings later that day, and my plans after work. I would be thinking about my friends and my love life (or lack thereof) – I found a way to think about everything BUT my breathing. It is very hard to turn off the mind! Over time, and through the words of the teacher, I have learned to let these wandering thoughts come into my mind and then flow out of my mind. It is a work in progress, but consistently practicing yoga has helped me be better at living in the present moment. When my mind wanders I am most often worrying about something, so I try hard to live in the present moment and soak in everything that is happening around me. There’s other positives too: a few months in I was able to flip my dog! Yoga is giving me strength – in mind, body, and soul. How is your year going? What have you done to focus on your one word for 2015?